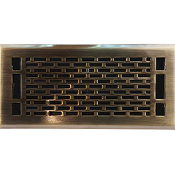 Trusted brand Accord floor vents in an attractive antique brass finish. 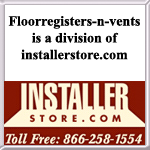 This line of residential decorative floor registers have a unique rectilinear design that will add to the decor of your home. The Manhattan antique brass floor registers are constructed of steel and have a rustproof adjustabled damper that makes installation simple. This Accord floor vents is sold in sizes 4x10, 4x12, 4x14 and 6x10. 61-0941 4 x 10 5.25" x 11.5"
61-0942 4 x 12 5.25" x 13.5"
61-0943 4 x 14 5.25" x 15.5"
61-0944 6 x 10 7.5" x 11.5"
This attractive Manhattan decorative floor register design is also available in the finishes Oil Rubbed Bronze and Satin Nickel.